This easy walk heads out towards Bath along the railway path, and back along the path beside the 'Saltford Straight', the dead straight stretch of the River Avon that has been used for over 150 years for rowing regattas. There is a bit of a scramble down from an embankment at one stage. A good walk for birdwatchers! Going: Easy. Beware of cyclists on the railway path. There is a bit of a scramble down from the railway path to the river path at one stage. Facilities: The Riverside Inn, The Bird In Hand. Climb the steps from the Bird in Hand car park up to the Bristol and Bath Railway path (or go through the bridge and up the path on the other side). 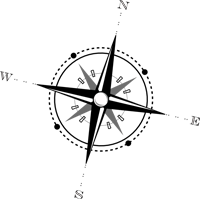 Walk southwards towards Bath. The Bristol And Bath Railway Path was built between 1979 and 1986 by the cycling charity Sustrans, which leased a five-mile (8.0 km) stretch of disused railway line near Saltford, with the help of the then Avon County Council, and using volunteers, to turn it into its first cycleway. The path follows the route of the Midland Railway Mangotsfield and Bath line, which was closed during the Beeching Axe of the 1960s in favour of the more direct former Great Western Railway between the cities. Soon after you leave the Bird in Hand you cross the fine bridge over the River Avon (1). The left side of the bridge provided a separate path that once provided pedestrian access for Saltford residents to Kelston Station, which was 100m or so further on. After the bridge, on your right, you can see the Saltford Environment Group's habitat restoration project (2). The plan is to recreate a habitat similar to that in the 1960s when railway gangers used to maintain the embankment slopes. At that time there were very long lengths of rough grassland, rich in herbs, wild flowers and the insects associated with them, and railway line would have had open vistas, rather than being surrounded by trees and undergrowth as it is today. Having cleared a section of trees in 2013 there are now splendid views to the west over the river. Sunlight now reaches the bank allowing grasses to flourish. Already some flowering plants are returning; there is a large area of ground ivy and several patches of crosswort (which isn't found anywhere else in Saltford). You can read more about the habitat restoration project on SEG's website from this link: Railway Path Habitat Project. About 50m beyond the habitat restoration is the site of Kelston Station (3) (see photograph above). It was known as Kelston (for Saltford) because the Midland Railway had to purchase land from local landowner Mr Inigo Jones of Kelston to create the track between Saltford and Bath. 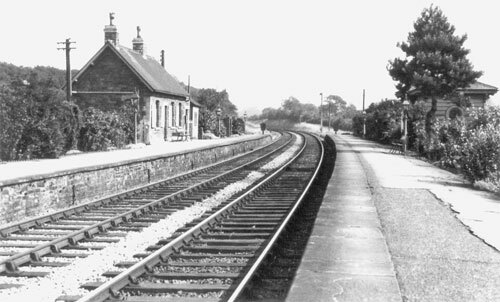 Mr Jones insisted that the station was positioned where it would benefit Kelston village even though this meant it would have no road access. Would-be passengers had to walk there down a track. It was opened in 1869 when the Midland Railway's Bath branch was opened. It was served by stopping trains to Mangotsfield and the Midland Railway terminus at Bristol St Philips or Bristol Temple Meads, via Bitton and Oldland Common. 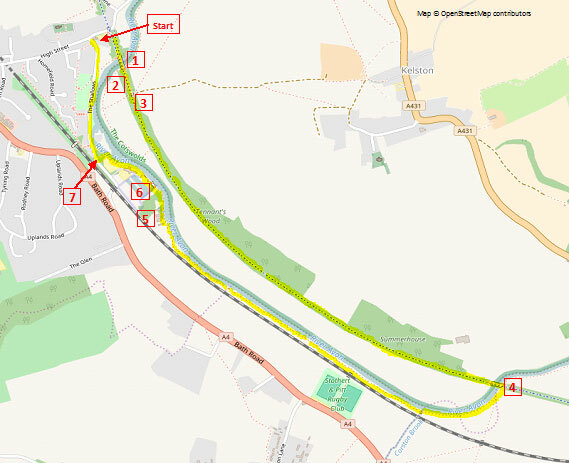 The station generated little traffic apart from fishermen, race days at Bath Racecourse, which could be reached by a three-mile trek over the fields (mostly uphill), or regatta days at Saltford. It closed at the end of 1948, though the line itself remained opened for passenger traffic until March 1966 and for goods to Bath gasworks until 1971. Keep walking along the railway path for about 1 mile. Through the trees you will see the Riverside Inn and the boathouses of the Saltford Rowing Centre on the opposite bank of the river. Under the fields just to your right, all the way along this stretch of the walk, runs the main sewage pipe from Bath to the Saltford Sewage Treatment Works. This 7.6km long, 700mm internal diameter pumping main was installed in 2005, and operates in conjunction with the existing 1914 cast iron pumped main, which roughly follows the route of the A4 from Bath to Saltford. Eventually you reach another bridge over the river (4). Cross it and then climb down to the river. The large house above you, Kelston Park, was built on the ridge overlooking the Avon River around the 1760s by John Wood, the Younger for Sir Caesar Hawkins, who was Serjeant-Surgeon to Kings George II and III. Sir Caesar Hawkins commissioned Capability Brown to lay out the park in 1767-8. In 1828 it was sold by the Hawkins family to Joseph Neeld who built many of the outhouses. It passed down through the family to the Inigo-Jones family, who added an entrance lodge and the porch over the main entrance. It is now used as offices. Go under the railway bridge that you have just crossed and follow the river path, which most of the way is sandwiched between the railway line (GWR) and the river. Eventually you reach the Saltford Rowing Centre. This stretch of the river is known as the Saltford Straight - a dead straight 1 mile stretch that has for over 150 years been used for rowing races. In July 1849 the first Bath Grand Regatta was held for rowing crews representing Bath, Bristol and Oxford, in a series of races over the 'Saltford straight'. 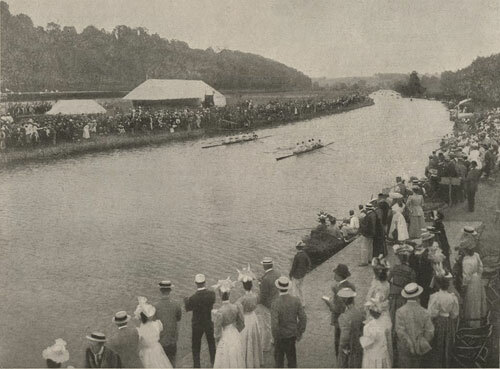 It was renamed the Saltford Regatta in 1890, continued until 1972, and was then revived in 2008. We have further information on the first Bath Regatta at Saltford here: Online Museum - 19th Century page. 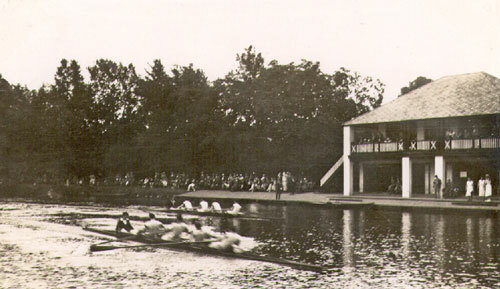 Rowing in the Jamaica Cup at the Saltford Regatta, 1930s. The Avon Rowing Centre (5) is home to Monkton Coombe School, Avon County Rowing Club and the University of Bristol Boat Club. The facility was opened on September 27th 2014 by Olympic rowing medallist and former Monkton Coombe School pupil, Alex Partridge, replacing buildings which were almost 100 years old (see photograph above). Avon County celebrated its 150th birthday in 2015. 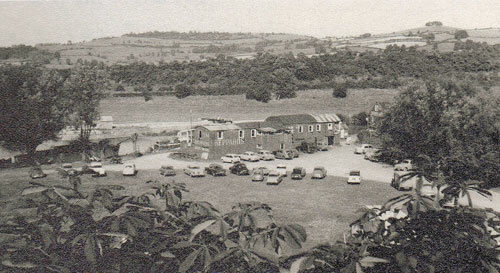 The original Avon RC was founded in 1865 and became Avon County RC in 1973 following a merger with Bristol RC. Rowing legend Sir Steve Redgrave won his first trophy racing at the Saltford Regatta when he was at school in Marlow. "The first and the best," he says. Continue along the river until you reach Saltford Marina (6). Cross the footbridge and continue to The Riverside Inn and Kelston Lock. 1962: Sheppard's Boat House by Kelston Lock. The Riverside Inn is built on the site of Sheppard's Boat House, a large and busy establishment that provided boats for hire and refreshments right up until the 1970s. Walk past The Riverside and into the grassy area beyond, and you will find the path continues beyond this along the river and then swings to the left to The Shallows. When you reach the road (7) turn right and follow the road back to The Bird in Hand.